The moon rose full and golden over the spruce trees last night, shining through my window in the family home near Lake of the Woods and Baudette, where a few days ago, I launched my novel. Growing up in this tight-knit community on the border with a tribe of friends, cousins and extended relatives, I always felt torn in two directions. On the one hand, I loved the close connections with people, to know and be known by everyone. On the other, I longed to explore the outside world, have some success and make Baudette proud of me. I left, like so many other young people. But as time went on, I grew increasingly grateful to this remote, beautiful chunk of earth with its wild bogs, water and forests which had bestowed on me the gift of a completely unique upbringing. Nearest public transportation 100 miles away. No television until I was 14. Rock n’ roll via the Canadian radio stations in Winnipeg. Walking freely and safely wherever I wanted. Air so fresh you could drink it. I spent years in Mexico City, in Austin, Texas. I traveled widely. But I always longed for Lake of the Woods. As I began to seriously write again, it emerged as my favorite subject. So it was no surprise that my debut novel, Hand Me Down My Walking Cane, arose straight out of the history of the borderland. 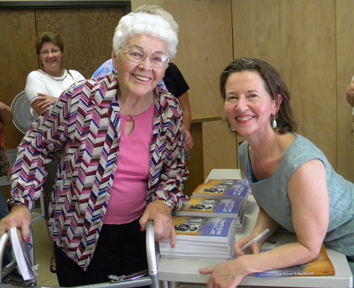 It was also no surprise that my dream was to inaugurate the book in Baudette. Three readings last weekend: The Smiling Moon Café, The Baudette Public Library and the Lake of the Woods Historical Museum. Unforgettable moments: Telling the story (which connects with my mother and great-grandfather) about how I came up with the title. Leila Kothrade, whose family famously resisted the relocation, and her accounts of what actually happened during the resettlement. The loving attention to detail at the museum reading: Fresh lemonade and old-fashioned molasses cookies. An entire photo exhibit of the Resettlement. Vicki Morrison-Goble and her sweet-voiced back-up singers with a sing-along rendition of “Hand Me Down My Walking Cane.” My 97-year-old Aunt Selma rolling in with her wheelchair and oxygen tank. I wrote the book to tell a story that had never been fictionalized. I wrote it to honor the old settlers. And I wrote it for my hometown and Lake of the Woods County. The warm receptions and the great coverage both before and after the readings have put me in a state of bliss and gratitude. Thank you, beloved borderland and the people in it. Thank you, northern muse that rises from the pines, flies through the night and still alights on my shoulder.